by Benjamin Stephens III, Ralph C. Watkins. Judson Press, 2009. The Millennial Generation is challenging congregational life in virtually all its aspects. This is true for Black congregations which must also deal with Hip Hop culture. Pastor Benjamin Stephens and Fuller Seminary author Ralph Watkins offer a comprehensive view of ministry to Black young adults. It is practical and pulls no punches. Challenging the notion that specialized ministries to youth is completed with high school, Stephens and Watkins begin with an examination of why a new approach to Young Adult ministry is needed. This is followed by a biblical mandate and a discussion of the unique needs of young adults and the life stages these include. A new model of ministry is then presented. Following each chapter there are a series of questions for discussion. And there are two important appendices. The first contains many documents, supporting data and programming/teaching suggestions. The second is an interesting conversation about the role of the senior pastor in relationship to young adults. 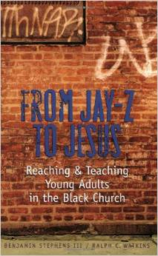 This work would be helpful for congregations looking for new and better ways to reach Black young adults.